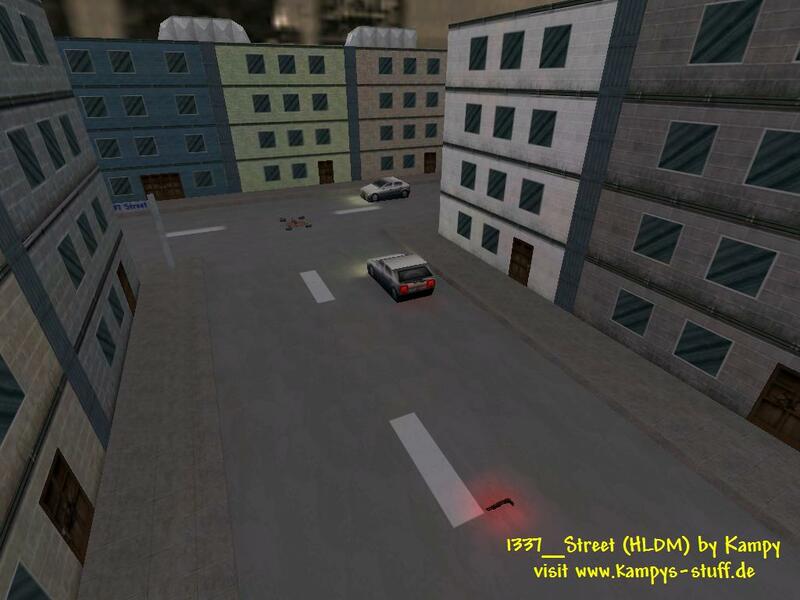 The name "1337_street" says two things about the map: it's a street, it's for 1337 players. Basically it's a street with seven houses four of which can be entered and two cars. 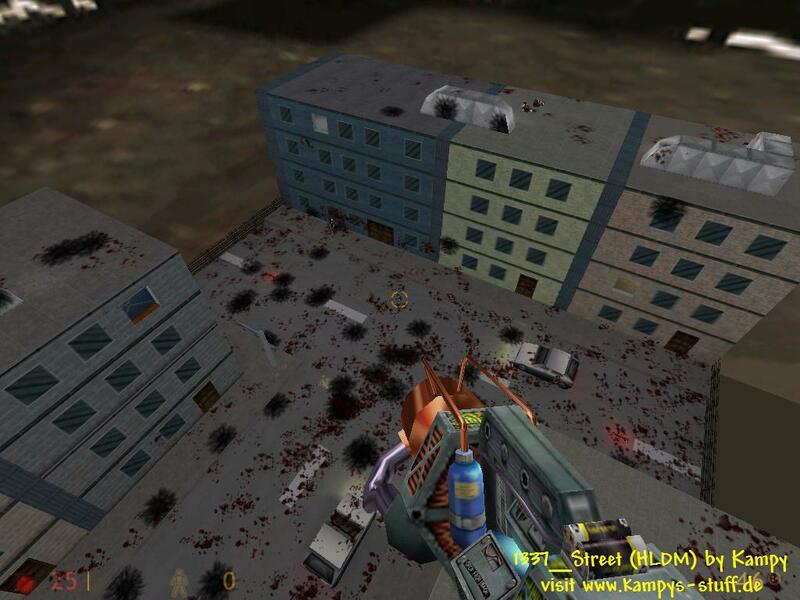 The fun at this map is that you can jump around with the gauss and fight on the roof tops - the taucannon is placed in the middle of the street with four gaussclips. Another great fun point is the accessability of the houses. Once you touch a door a sequence starts and you receive the crossbow + ammo, a health kit, a battery and get teleported into the house. In these houses you can break the windows and snipe around. In this map there's a lot of action all the time, because actually the map is one big room - some said it was a killbox (grrr). The map doesnt look as bad as a killbox although it's a simple look with little details, but the r_speeds are very good for the structure of the map (max 450!). The weapons Glueon and Beegun are missing which is a pretty wise decision otherwise the map would lame a lot. The mostly used weapons are the taucannon, shotgun, RPG, colt and crossbow. When you leave a house through its door you will get the LongJump. 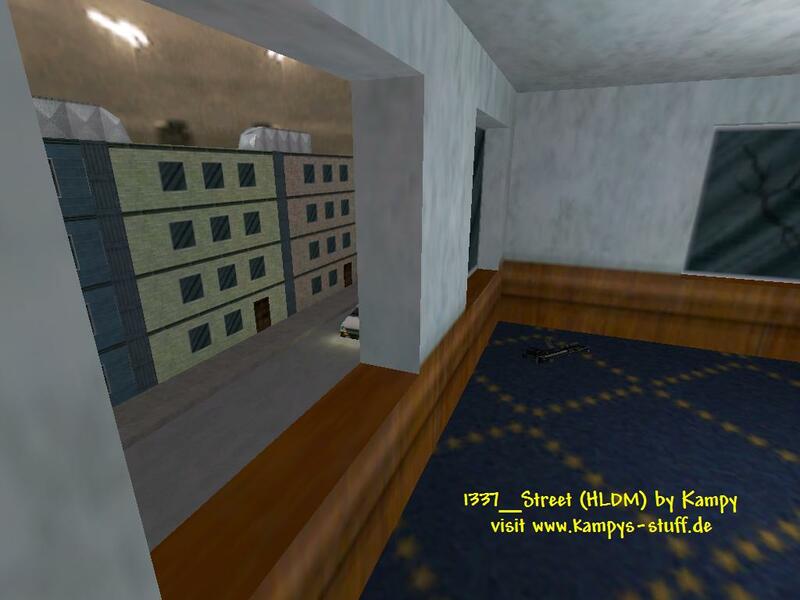 This map is big fun for a game without lamers, it's for people who like flying around with the gauss and sniping through windows and have a lot of action all the time. want a Fun-Map? download now!